Traditionally, only antimicrobials have been used as the chemotherapeutic modality for the treatment of periodontitis. Though bacteria are the primary etiologic factors of periodontal diseases, yet the extent and severity of tissue destruction seen in periodontitis is determined by the host immuno-inflammatory response to these bacteria. This increasing awareness and knowledge of the host-microbial interaction in periodontal pathogenesis has presented the opportunity for exploring new therapeutic strategies for periodontitis by means of targeting host response via host-modulating agents. This has lead to the emergence of the field of "Perioceutics" i.e. the use of parmacotherapeutic agents including antimicrobial therapy as well as host modulatory therapy for the management of periodontitis. These host-modulating agents used as an adjunct tip the balance between periodontal health and disease progression in the direction of a healing response. In this article the host-modulating role of various systemically and locally delivered perioceutic agents will be reviewed. Periodontitis is caused by bacterial biofilms and is modulated by a variety of risk factors. The periodontal ligament comprises heterogeneous cell populations which are lost in the disease process. A variety of regenerative therapies, such as bone grafts, guided tissue regeneration treatment, application of enamel matrix derivative, have been introduced, with some success in periodontal tissue regeneration. Topical application of recombinant cytokines is now one of the most effective methods to stimulate stem cells. Researchers are now exploring the potential applications and uses of fibroblast growth factor in periodontal regeneration. Background: The primary etiologic factor of periodontitis is the subgingival infection with a group of Gram negative pathogens. Transient bacteremia in periodontitis patients underlie chronic production and systemic increases of various proinflammatory mediators, including Interleukin (IL)-1α, IL-6, C-reactive protein and Tumor necrosis factor (TNF)-α. P- selectin is a member of selectin family of cell surface receptor which is located in the membrane of the secretory granules (alpha granules) of platelets and in the membrane of the Weibel-Palade bodies of the vascular endothelial cells. P selectin redistributes from the membrane of the granules to the plasma membrane when platelets and endothelial cells are activated and thus degranulated. Aim: To compare the level of platelet activation, soluble P Selectin level and morphological changes and aggregation of platelets in patients in periodontitis patients compared to healthy controls. Materials and Methods: 80 patients were included in the study with the age group of 35-60. The patients were divided into 2 groups, 40 subjects with generalized chronic periodontitis and 40 healthy subjects taken as control. Periodontal Examination using clinical parameters namely, Bleeding Index, Plaque Index, Probing Pocket Depth and Clinical Attachment Level were recorded. Collection of blood samples for estimation of serum soluble P- selectin level by ELISA method. Evaluation of Platelet morphology and grading the platelet aggregation. Results: P-selectin expression shows that the mean value for control group is 4.97 ± 16.56 ng/mL and study group 13.05 ± 29.94 ng/mL which was significantly higher than control group with P value 0.001. Platelet morphological changes shows small form - mean value for control group is 75.83% ± 14.24% while for study group is 39.08%. ± 21.59; Big form - mean value for control group 0.80% ± 0.35% while for study group 0.48% ± 1.3%and Spider form- mean value for control group 23.88% ± 14.13 while study group 59.32% ±. 23.42.The observation showed high statistical significance with P- value < 0.001 for small and spider form and no statistical significance for big form P = 0.075. Conclusion: Increased expression of P-selectin, spider form of platelets and pathological aggregation pattern which indicates that platelet activation may be associated with chronic periodontitis. The results of the study showed, higher number of spider forms and significant pathological aggregation pattern in periodontitis patients which indicates activation of platelets thus emphasized that periodontitis can be an contributing factor in the development of cardiovascular disease. Background: Initial research has shown a negative correlation between the severity of periodontal disease and tissue inhibitor of matrix metalloproteinases (TIMPs) concentrations in gingival crevicular fluid (GCF). However, there are no enough reports to correlate the TIMP-1 concentrations in GCF in periodontal health, disease and after treatment. Hence, the present study aim is to estimate the levels of TIMP-1 in GCF in periodontal health, disease and to evaluate the effect of periodontal therapy on TIMP-1 concentrations in GCF. Materials and Methods: Periodontal examination and collection of GCF by extracrevicular method was performed in 25 subjects selected randomly and categorized into three groups. Group I (Healthy, n = 10), Group II (chronic periodontitis (CP), n = 15) and Group III (After treatment group, n = 15). Scaling and root planning was performed and GCF was collected after 8 weeks of treatment. TIMP-1 levels were estimated in GCF samples by using enzyme linked immunosorbent assay. Results: TIMPs-1 was detected in all samples. Highest mean TIMP-1 concentrations in GCF were obtained for Group I, whereas the lowest concentrations were seen in Group II. This suggests that TIMP-1 levels in GCF decreases proportionally with the progression of periodontal disease and increases after treatment. Conclusion: There is a substantial decrease in the concentrations of TIMP-1 in CP patients than in healthy and after treatment individuals. Since TIMP-1 levels in GCF are negatively correlated with periodontal disease, TIMP-1 may be considered as a biomarker in periodontal disease progression. However, controlled, longitudinal studies are needed to confirm this possibility. Aims and Objectives: (1) To evaluate the effect of type 2 diabetes mellitus on salivary TNF-α level in chronic periodontitis. (2) To evaluate the effect of smoking on salivary TNF-α level in chronic periodontitis. (3) To compare and correlate TNF-α level with the healthy individuals. 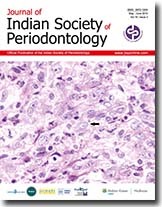 Materials and Methods: Subjects aged 30-35 years were included for the study and divided into four groups as a group of 20 systemically and periodontally healthy individuals (group I), a group of 20 subjects with pocket probing depth (PPD) ≥5 mm and clinical attachment loss (CAL) of ≥2 mm (group II), a group of 20 diabetic subjects (of more than 5 years) with periodontal parameters as of group II as (group III) and a group of 20 subjects smoking (≥10 cigarettes a day) with periodontal parameters of group II as (group IV). Periodontal parameters of PPD, CAL, gingival index (GI), and plaque index (PI) were measured using standard indices and criteria. Three milliliter of unstimulated saliva was taken and salivary TNF-α determined by using ELISA technique (Quantikine Human total TNF-A immunoassay kit). Results: Data revealed highest mean TNF-α in group III followed by group IV, group II, and group I. Mean TNF-α of both group III (76.1%) and group IV (48.8%) was significantly higher as compared to group I (P < 0.001). Mean TNF-α of group III was also found to be significantly different and higher (68.1%) as compared to group II (P < 0.001). Although higher mean TNF-α (31.5%) was found in group IV in comparison to group II, the difference was not statistically significant. Besides above, TNF-α also showed a direct positive correlation with PPD in group II (r = 0.30, P > 0.05) and a significant negative correlation was observed between CAL and TNF-α in group IV. Conclusion: Our study clearly underlines a profound impact of diabetes and smoking on salivary TNF-α in chronic periodontitis subjects in comparison to healthy subjects. Moreover, diabetes status increased TNF-α significantly in comparison to smoking in chronic periodontitis patients. 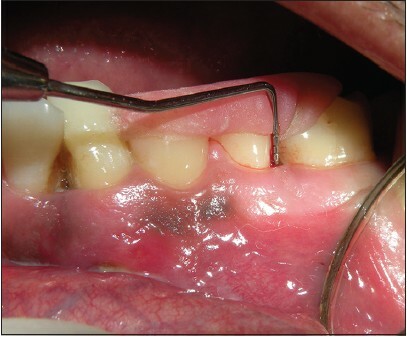 Background: Drug-induced gingival overgrowth is a common finding in the modern era. These gingival overgrowths are usually treated by various modalities namely substitution of drugs, surgical, and non-surgical treatment. The recent concept mainly involves full-mouth scaling and root planing (the entire dentition in two visits within 24 hours, i.e., two consecutive days) followed by chair side mouth rinsing by the patient with a 0.2% chlorhexidine solution for 2 minutes and brushing the tongue of the patient with 1% chlorhexidine gel. This is followed by an additional subgingival irrigation (three times, repeated within 10 minutes) of all pockets with a 1% chlorhexidine gel. 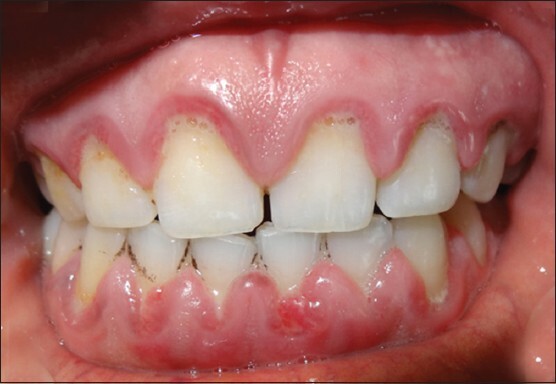 Materials and Methods: Twenty patients between the ages of 20 and 50 years with drug-induced gingival overgrowth were treated using the full-mouth disinfection approach. The patients were evaluated at 3 months and 6 months after therapy. The data obtained for plaque index, bleeding on probing index, probing pocket depth, and gingival overgrowth scores were tabulated and compared statistically using the one sample unpaired t test. Statistical Analysis: Statistically significant difference (P < 0.05) was found in PI GBI, PPD, and GO score between baseline, 3 months, and 6 months. Results: All clinical parameters improved significantly after therapy without the need of further surgical treatment. Conclusions: Full-mouth disinfection might be a beneficial treatment concept in patients with drug-induced gingival overgrowth, thus decreasing the need for surgical therapy. Background: The relatively safe nature and cost-effectiveness of herbal extracts have led to a resurgent interest in their utility as therapeutic agents. Therefore, this prospective, double-blind, randomly controlled clinical trial was designed to compare the antiplaque and antigingivitis effects of newly formulated mouthrinse containing tea tree oil (TTO), clove, and basil with those of commercially available essential oil (EO) mouthrinse. Materials and Methods: Forty patients were selected for a 21-day study period and randomly divided into two groups. The test group patients were given newly formulated herbal mouthrinse and the control group patients were given commercially available EO mouthrinse. The Plaque Index (PI), Gingival Index (GI), and Papillary Marginal Attachment (PMA) Index were recorded at baseline, 14 days, and 21 days. The microbial colony forming units (CFU) were assessed at baseline and 21 days. Results: Test group patients using herbal mouthrinse showed significant improvement in GI (0.16), PI (0.57), and PMA (0.02) scores. These improvements were comparable to those achieved with commercially available EO mouthrinse. However, the aerobic and anaerobic CFU of microbiota were reduced with the herbal mouthrinse (P = 0.0000). Conclusion: The newly formulated herbal mouthrinse and commercially available mouthrinse were beneficial clinically as antiplaque and antigingivitis agents. 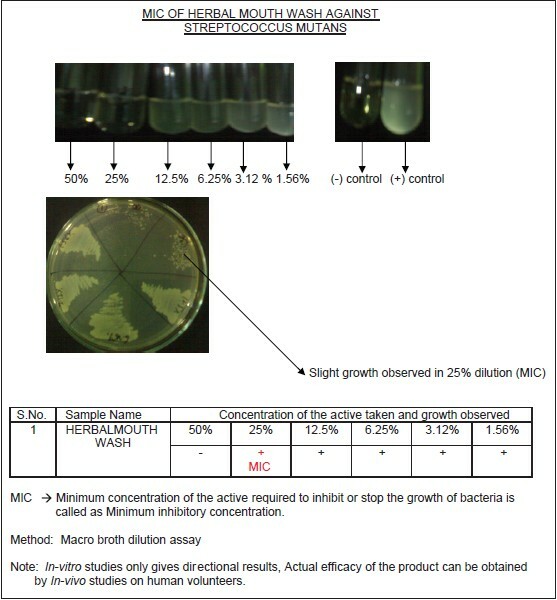 Newly formulated mouthrinses showed significant reduction in microbial CFU at 21 days. So, our findings support the regular use of herbal mouthrinse as an antiplaque, antigingivitis, and antimicrobial rinse for better efficacy. Aims: Periodontal disease has been considered a systemic exposure implicated in a higher risk of adverse pregnancy outcomes. The aim of the present study was to determine whether maternal oral health is associated with an increased risk of pre-eclampsia. Subjects and Methods: A case-control study was conducted which included 40 pregnant women patients admitted to the Department of Obstetrics and Gynecology, J.N. Medical College, A.M.U, Aligarh. Pre-eclampsia was defined as classic triad of hypertension, proteinuria and symptoms such as swelling/edema esp. in hands and face, headache, visual changes etc., A periodontal examination was done during 48 h after child delivery. Maternal oral status was evaluated using gingival index by Loe and Silness, oral hygiene index (simplified) by greene and vermillion and periodontal pockets and clinical attachment level (CAL). Statistical Analysis: Null hypothesis that no difference exist between the two groups (pre-eclamptic and non-pre-eclamptic Group) was calculated using paired t-test, Chi-square and Mann-Whitney U statistical tests using SPSS 11.5 (Statistical Package for Social sciences, Chicago). P < 0.05 was considered to be statistically significant. Results: The amount of gingival inflammation, oral hygiene levels, pocket depth and CALs as measured by their respective indices were higher in the pre-eclamptic group when compared to non-pre-eclamptic group. Furthermore CAL was significantly increased in the test group. This study showed that pre-eclamptic cases were more likely to develop periodontal disease (P < 0.05). 30% of the test group and 65% of the case group had periodontal disease (P < 0.05) which had shown that pre-eclamptic cases were 4.33 times more likely to have periodontal disease (odds ratio = 4.33). Conclusions: Maternal oral status was determined to be associated with an increased risk of pre-eclampsia. Background: Various surgical techniques have been proposed for treating gingival recession. 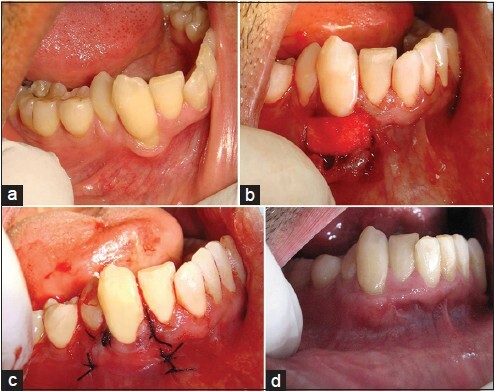 This randomized clinical study compared the effectiveness of using a sub-epithelial connective tissue graft (SCTG) combined with an overlying double pedical graft (DPG) or a coronally positioned flap (CPF) in the treatment of isolated gingival recession. Materials and Methods: A total of 20, healthy, non-smoking subjects with single Miller's Class I or Class II recession defects were selected. The defects, at least 3.0 mm deep, were randomly assigned to the test (DPG + SCTG) or control group (CPF + SCTG). 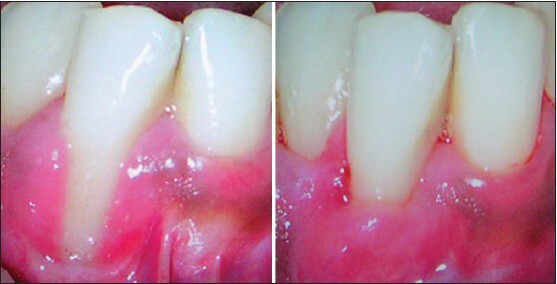 Gingival recession (REC), probing pocket depth (PPD), clinical attachment level (CAL), width of keratinized gingival tissue (WKG), plaque index and papillary bleeding index were assessed at baseline and 6 months post-operatively. Results: Recession depth was significantly reduced 6 months post-operatively (P < 0.05) for both groups. Mean root coverage was 88% and 84% in the test and control groups, respectively. There were no significant differences between the two groups in REC, PPD, CAL, or WKG at baseline. However, at 6 months post-operatively, there were statistically significant changes in REC, CAL and WKG in favor of the test group (P < 0.05) from the baseline, but the comparison between the two was not statistically significant. The percentage of teeth with complete root coverage was greater in the test group when compared to the control group, but the results were not statistically significant. Conclusions: The results indicate that both surgical approaches are effective in addressing root coverage. Furthermore, when an increase in keratinized tissue width is a desired outcome, both the treatment modalities have shown comparable outcomes. Objective: The purpose of the study was to evaluate the clinical effectiveness of periosteum as a barrier membrane for the treatment of intrabony defects. Materials and Methods: The study was conducted in patients having bilateral intrabony defects. A total of 20 intrabony defects in 10 patients were treated, out of which 10 defects received periosteal barrier and the other 10 defects received conventional open flap debridement procedure. The efficacy of the treatment was assessed using clinical parameters and dentascan. Results: Statistically significant gain in clinical attachment level (CAL) was found in the test group (2.00 ± 0.26 mm) as compared to the control group (0.60 ± 0.22 mm). In both the treatment modalities (test and control groups), a significant decrease in probing pocket depth of 3.90 ± 0.35 mm and 2.90 ± 0.31 mm was observed, respectively. The difference between the two groups was not statistically significant. Bone defect fill was 1.40 ± 0.16 mm for the test group and 0.90 ± 0.18 mm for the control group, but the difference observed was not statistically significant. Conclusion: The results of this study show that periosteal barrier membrane can be a better alternative of barrier membranes for the treatment of intrabony defects. Background and Objectives: The purpose of this study was to compare the efficacy of bovine-derived xenograft (Bio-Oss Collagen) and Type I collagen membrane (Bio-Gide) with bovine-derived xenograft (Bio-Oss Collagen) and fibrin fibronectin sealing system (TISSEEL) in the treatment of periodontal infrabony defects. Materials and Methods: Fourteen healthy patients in the age range of 20 to 60 years, showing bilateral or contralateral infrabony defects were selected. The defects were assigned randomly to Site A (bovine-derived xenograft [Bio-Oss Collagen] with bioresorbable Type I collagen membrane [Bio-Gide]) and Site B (fibrin fibronectin sealing system [TISSEEL] with bovine-derived xenograft [Bio-Oss Collagen]). The radiographic parameters were recorded at baseline, 6 months, and 9 months postoperatively. Results: All fourteen patients returned for recall at regular intervals till the completion of the study. Both the experimental groups showed clinically and radiographically statistically significant reduction in probing pocket depth and gain in clinical attachment level. Conclusion: Both groups showed potential for enhancing the periodontal regeneration with no statistically significant between the two groups; however, on comparison the Bio-Oss Collagen and TISSEEL group were slightly better. Aim: To assess the clinical outcome by comparing β-tri calcium phosphate (Septodont RTR) TM along with platelet rich plasma (PRP) and β-tri calcium phosphate (β-TCP) alone in intrabony defects, by clinical evaluation in a 6-month analysis. Methodology: Ten patients participated in the study. Using a split-mouth design, interproximal bony defects were surgically treated with either platelet rich plasma (PRP) combined with β-tri calcium phosphate (β-TCP) or β-TCP alone. Plaque Index (PI), Gingival Index, Probing Pocket Depth (PPD), Clinical Attachment Level (CAL) were recorded 6 months after surgery. Results: At 6 months after therapy, the PRP combined with β-TCP group showed mean PPD reduction of 2.50, CAL mean gain of 2.60 + 1.43. The β-TCP group showed mean PPD reduction of 2.80 mm, mean CAL gain of 2.60 mm. On intra-group comparison, there was greater PPD reduction and CAL gain at 6 months in both the groups. In intergroup comparison of PRP/β-TCP and β-TCP alone, there was no statistical significant difference observed. (P = 0.55, and 0.87 for PPD and CAL gain). Conclusion: Both therapies resulted in significant PPD reduction, CAL gain. The present study shows that treatment of intrabony periodontal defects with combination of PRP and β-TCP does not have additional improvements when compared with β-TCP alone within 6 months follow-up. Objective: Obtaining predictable and aesthetic root coverage has become an important part of periodontal therapy. The search for the appropriate root coverage techniques has resulted in many different approaches. The goal of this study was to evaluate the degree of patient acceptance with acellular dermal matrix (ADM) allograft in the treatment of buccal gingival recession and to compare it with subepithelial connective tissue graft. Materials and Methods: Thirty patients with Miller's class II recessions were treated and randomly assigned to the test group (ADM) and control group (subepithelial connective tissue graft). All patients underwent full periodontal evaluation and pre-surgical preparation, including oral hygiene instructions and scaling and root planing. The exposed roots were thoroughly planed and covered by a graft without any further root treatment. Results were evaluated based on the parameters measuring patient satisfaction and clinical outcome after 6 months of the surgical procedure. Results: Postoperatively, significant root coverage, reduction in probing depth, gain in clinical attachment level, and increase in widths of keratinized tissue and attached gingiva were observed on intra-group comparison. There was no significant difference in any of the parameters between test and control groups. Conclusion: The subepithelial connective tissue graft and ADM graft were able to successfully treat gingival recession defects; however, the ADM showed better patient acceptance than the connective tissue graft. Background: Halitosis or oral malodor is characterized by unpleasant odor arising from the oral cavity. The prevalence of halitosis however is not studied extensively. The aim of this study was to evaluate the self perception of oral malodor and oral hygiene habits amongst dental students. Materials and Methods: A structured questionnaire consisting of ten questions was administered to 285 undergraduate students of Madha Dental College and Hospital. The questionnaire was designed to evaluate the self perception of halitosis, oral hygiene aids used, presence of dental caries, gingival bleeding, and dryness of mouth. Results: Of the 285 students, 259 students completed the questionnaire. The response rate was 90%, with male response rate being 85.7% and female 95.8%. Self-perceived halitosis was reported by 44.1% males and 45.32% females. The difference in reporting self-perception of halitosis between females and males was found to be statistically significant (P < 0.05). Significant difference was found for use of mouth wash, presence of carious teeth, bleeding gums, and use of tongue cleaners between females and males (P < 0.05). Conclusion: The results of this study indicate higher prevalence of halitosis among this population consisting of dental students. The awareness of halitosis was also higher among this population. The awareness of halitosis as an individual entity should be promoted to the general population and the therapeutic measures should be made available to all. Objectives: To assess the knowledge, attitude, self-reported practices, and prescription patterns regarding dental floss amongst a select population of dentists in India. 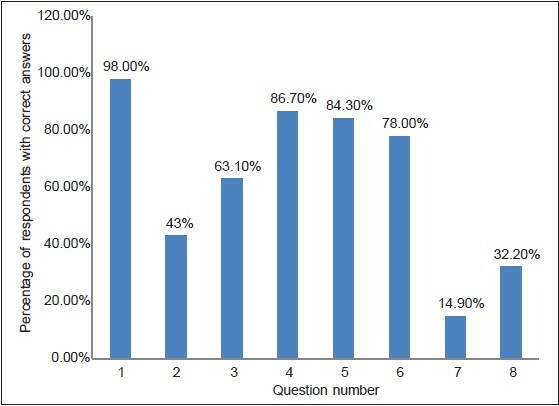 Materials and Methods: A pretested 30-item questionnaire was self-administered by authors to the dental faculty and postgraduate students in dental schools in Delhi-National Capital Region (NCR). Nine dental institutes were selected by simple random sampling procedure among 15 institutions and a total of 255 dentists were included in the study. Statistical Analysis: The data obtained were analyzed by SPSS version 18. 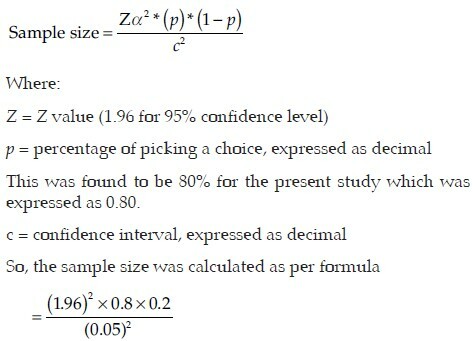 Descriptive statistics such as frequencies were calculated and Pearson's Chi-square test was used with P value fixed at 0.05. Results: There was lack of adequate knowledge regarding dental floss, among dentists in India. 78% of the dentists responded that the routine use of dental floss was necessary for good periodontal health. Majority of the dentists cited lack of awareness, availability, and cost as the major factors affecting floss usage. Lack of training in the dental education programs may have an impact on the prescription patterns as well. 15.3% of those surveyed do not use floss at all. 63.9% of the dentists prescribed floss routinely to their patients and considered factors like education, occupation, and socioeconomic status of the patient before prescribing dental floss. Conclusion: Health education programs regarding dental floss are necessary to create awareness among the general population and adequate training at undergraduate level is also essential to increase the prescription practices. Dentists should practice recommended oral self-care and act as role models. Background: Oral hygiene is intimated in health of all parts of the body including oral cavity. The understanding of actual practices in keeping the oral heath at standard based on patient's perceptions of oral health care is vital. Understanding the effect of gender on oral health would facilitate the development of successful attitude and behavior modification approach towards sustainable oral health. Purpose of Study: To evaluate awareness regarding oral hygiene practices and exploring gender differences among patients attending for oral prophylaxis. Materials and Methods: A survey was conducted among 250 patients attending the department of periodontology, Maulana Azad institute of dental sciences for oral prophylaxis. 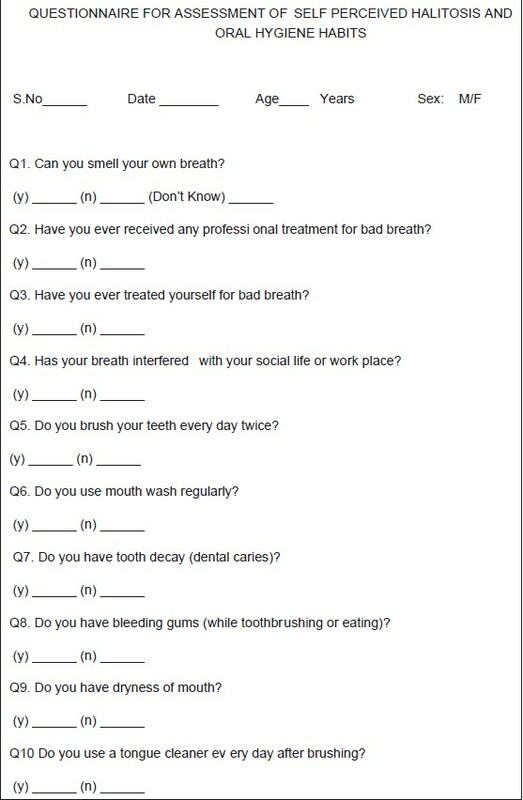 A structured questionnaire was used to collect information regarding practices and perception about oral hygiene. Results: Majority of the patients (60.4%) felt that oral hygiene is mandatory for overall health of the body. 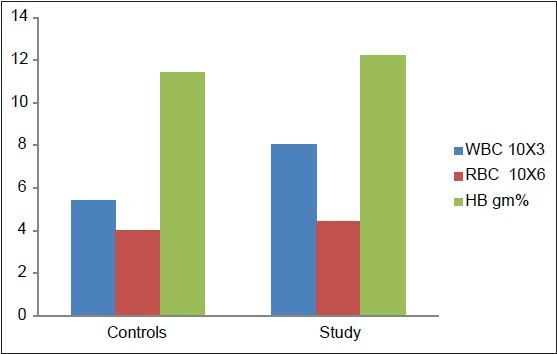 The use of toothpaste and toothbrush (83.6%) was the most preferred cleaning aid among the study population in the present study. The major constraint for avoiding dental examination was no felt need (41.2%) followed by cost of dental treatment (26.8%) and time constraints (24.0%). Conclusions: Professional plaque removal and regular follow-up combined with oral hygiene instructions to the patients can minimize the level of gingival inflammation and swelling. The poor resources for dental care, common malpractices and nonavailability of professional care are the main barriers in seeking optimum oral hygiene. Inflammatory myofibroblastic tumor (IMT) is a rare tumor of uncertain origin with variable biological behavior ranging from reactive lesions to highly aggressive malignancy. Oral IMTs are extremely rare and only 25 cases had been reported so far. A case of IMT with sarcomatous transformation in an extraction site with a history of tooth extraction following tooth mobility of an upper left molar tooth is presented here. The tooth was extracted following a complaint of gingival swelling and mobility of tooth. 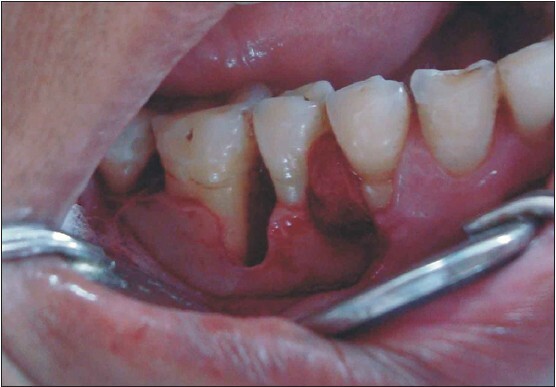 Though malignant transformation in IMTs had been documented in the extra oral sites, wide search of associated literature suggests, this is the first case of oral IMT showing malignant change associated with gingiva. 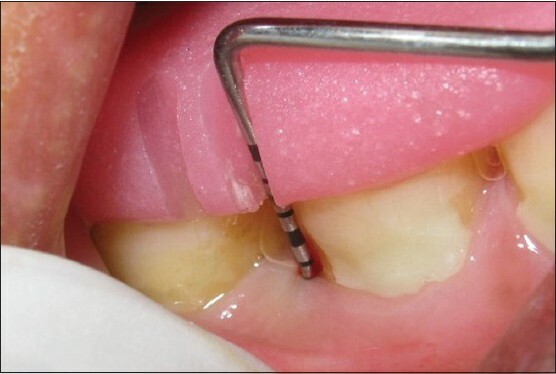 The case report attempts to highlight the variant possibilities of tooth mobility other than periodontitis and the importance of assessing the primary cause of such conditions. Plasma cell mucositis (PCM) is a very rare, chronic, multifocal, idiopathic, non-neoplastic plasma cell proliferative disorder of the upper aerodigestive tract. The classic clinical presentation is an intensely erythematous mucosa with surface changes described variously as papillomatous, cobblestone, nodular or velvety. It is a very rare condition <50 cases reported in literature. 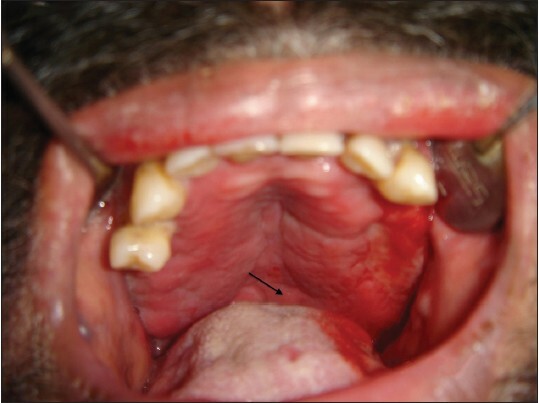 A 72-year-old male patient complained of sore throat, stomatodynia, dysphagia, multiple oral ulcers, enlarged swollen bleeding gums and mobile teeth. 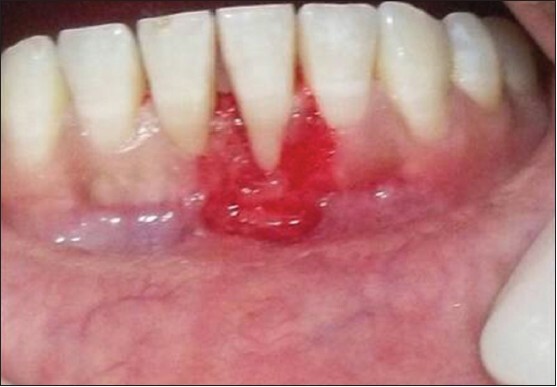 There was chronic inflammatory enlargement of the gingiva and palate with severe periodontitis. Histopathological examination revealed a hyperplastic epithelium with a dense infiltrate of mature polyclonal plasma cells in the superficial layer of the lamina propria. PCM is a diagnosis of exclusion, to be differentiated from other infective, reactive, autoimmune, allergic and neoplastic disorders with plasma cell infiltrates. Management with surgical and immunosuppressive therapy is mostly ineffective with short remissions and frequent relapses. Desquamative gingivitis is a gingival response associated with a variety of clinical conditions and characterized by intense erythema, desquamation and ulceration of free and attached gingiva. A variety of diseases such as lichen planus, pemphigus, pemphigoid, dermatitis herpetiformis, linear IgA disease, lupus erythematosus, erythema multiformae manifest clinically as desquamative gingivitis. Of all the disease entities, Lichen Planus is a relatively common disorder affecting the skin and mucous membrane. Very often it has oral manifestations. These lesions of oral lichen planus (OLP) have myriad but distinct morphology. 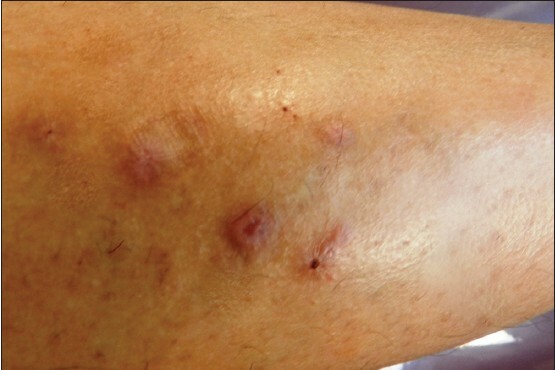 As they mimic other mucocutaneous disorders with regard to clinical appearance, many lesions of oral lichen planus go undiagnosed or are wrongly diagnosed. Reported here are two cases of desquamative gingivitis. One of these was diagnosed as erosive lichen planus based on the symptoms, clinical findings, histologic, and immunofluorescent examination. Further management was done in consultation with a dermatologist. von Willebrand disease (vWD) is an inherited bleeding disorder affecting both the sexes with a prevalence of approximately 1% in general population. The cause for bleeding in this disorder can be attributed to the primary deficiency or defect in von Willebrand factor (vWF) that results in the platelet adhesion abnormalities. It is characterized by bleeding episodes that may be severe and life threatening, menorrhagia in females, epistaxis, and gingival bleeding and enlargement. A case of 29-year-old female having all the characteristic features of vWD is presented. The family history revealed consanguineous marriage of the parents. The patient was initially on oral contraceptives, but later she underwent diagnostic hysteroscopy with endometrial ablation with roller ball to treat menorrhagia. Ankyloglossia is an uncommon congenital oral anomaly that can cause difficulty with breast-feeding and speech articulation. For many years, the subject of ankyloglossia has been controversial with practitioners of many specialties having widely different views regarding its significance and management. 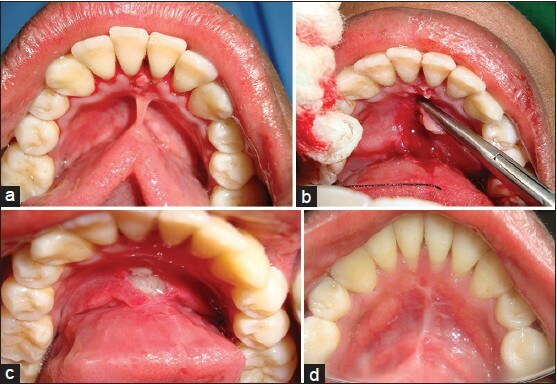 This study is about a series of five cases of ankyloglossia subjected to surgical correction by frenectomy procedure. Three cases were treated with electrocautery, one case with diode laser and one case with conventional scalpel technique. 1 week and 1 month post-operative follow-ups were done and healing was compared with the available literature. Manipulation of tissues was better in laser and electrocautery techniques when compared with scalpel. 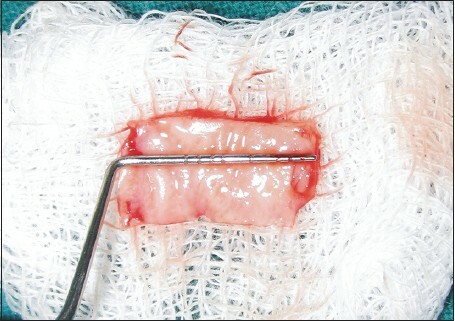 Post-operative complication of swelling and pain was seen in scalpel technique whereas it was largely uneventful in other techniques. Though, there was no difference in healing at the end of first month clinically, scalpel technique has shown better results in organization of muscle fibers. 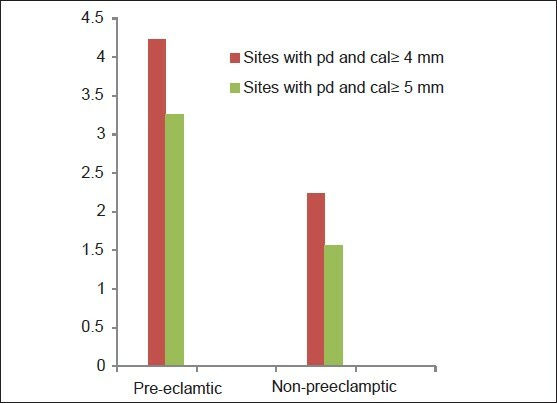 This clinical study indicates that laser and electrocautery treatment used for frenectomy operations provides better patient perception in terms of postoperative pain and function than that obtained by the scalpel technique. Considering the above advantages, when used correctly, the laser and electrocautery offers a safe, effective, acceptable and impressive alternative for frenectomy operations. Background: Owing to its stimulatory effect on angiogenesis and epithelialization, platelet-rich fibrin (PRF) is an excellent material for enhancing wound healing. The use of PRF dressings may be a simple and effective method of reducing the morbidity associated with donor sites of autogenous free gingival grafts (FGGs). The purpose of this case series is to document the beneficial role of PRF in the healing of FGG donor sites. Materials and Methods: A total of 18 patients treated with FGGs could be classified into two groups. PRF was prepared, compressed and used to dress the palatal wound followed by a periodontal pack in one group (10 patients) and only a periodontal pack was used in the other group (8 patients). Post-operative healing was assessed clinically at 7, 14 and 21 days and the morbidity was assessed qualitatively by an interview. Results: Sites where PRF was used showed complete wound closure by 14 days and these patients reported lesser post-operative morbidity than patients in whom PRF was not used. Conclusions: PRF as a dressing is an effective method of enhancing the healing of the palatal donor site and consequently reducing the post-operative morbidity. Low level laser therapy (LLLT) is widely used during the post-operative period to accelerate the healing process. It promotes beneficial biological action on neovascularization with anti-inflammatory and analgesic effects. Two systemically healthy patients with Miller's grade II recession on 33 and 41, respectively, were treated with free gingival graft. After surgery, second patient received LLLT using a 830 nm diode laser, with output power of 0.1 W on the first day half hour following surgery, on the third day, seventh day, and lastly on the ninth day. Both the patients were asked to assess the pain on second, fourth and tenth day using a Numerical Rating Scale and revascularization of the grafted area was assessed using a color Doppler ultrasound imaging on the fourth and the ninth day. Neovascularization was noted in both the patients but the second patient elicited marked increase in vascularity on the fourth as well as the tenth day and drastic reduction in pain on day four, with no change on the tenth day. The results showed that LLLT was an effective adjunctive treatment in promoting reevascularization and pain control during early healing of free gingival graft. The guided bone regeneration (GBR) is a technique that uses resorbable and non-resorbable membranes in association with other filling biomaterials. GBR is one of the optional treatments for therapy of class II furcation defects. The current case report evaluates clinically and radiographically the use of the cyanoacrylate membrane (Glubran ®2) associated with organic bovine bone (GenOx) for the treatment of vestibular class II furcation defect on the lower left molar. Conclusion: The GBR is an option in the treatment of vestibular class II furcation defects and cyanoacrylate surgical glue, acting as a mechanic barrier and providing an efficient stability for the graft. The quest for exploring new frontiers in the field of medical science for efficient and improved treatment modalities has always been on a rise. Extracorporeal shock wave therapy (ESWT) has been enormously used in medical practice, principally, for the management of urolithiasis, cholelithiasis and also in various orthopedic and musculoskeletal disorders. The efficacy of ESWT in the stimulation of osteoblasts, fibroblasts, induction of neovascularization and increased expression of bone morphogenic proteins has been well documented in the literature. However, dentistry is no exception to this trend. The present article enlightens the various applications of ESWT in the field of dentistry and explores its prospective applications in the field of periodontics, and the possibility of incorporating the beneficial properties of shock waves in improving the treatment outcome.